Already up to level 27 crafting on this account which I will probably turn into a G-Mauler (it already has level 10 Attack and 11 HP) or maybe a zerker, idk yet. 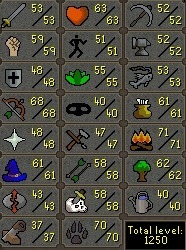 I have a few other Alt accounts which I know have not yet been logged into OSRS that I could potentially turn into Obby Maulers or something but I really don't have a plan for yet so I will keep mostly untouched, combat-wise at least. Checking through multiple Alt Accounts, apparently I had already logged into and trained on several of these, however I found an account still at base combat stats and completed Romeo and Juliet to remove it's GE restrictions. It is sitting on 2 experience lamps in inventory which I am saving for after completion of the Knight's Sword quest. This will likely be the account that I make into an Obby Mauler, if any. Broke Nergal's bank OSRS, forked over 5m to switch my respawn to edgeville. Did several Treasure Trails on OSRS probably made between 1 and 2m or so; went through some of my RS3 banked clues and got around 500k off of an elite clue. -Working towards 1250 total level for the kill total worlds, at 1236 right now so shouldn't take too long. 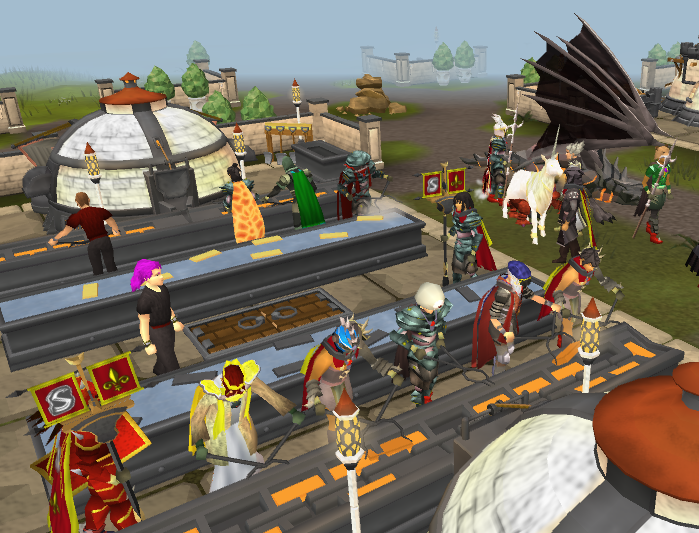 -Getting a full graceful outfit while training agility. 51 Agility, took a break to complete the Mage Arena miniquest, grabbed a god cape. Still need to do the 100 casts for each of the spells in the arena, but small steps. 49 Mining, one step closer to my last Heroes quest requirement (aside from another person). My buddy called up looking to play League of Legends, so I'm probably about done with RS for the day. Up to 70 Hunter and 51 Mining. I now have all skill-based pre-requisites for Hereos Quest. Although I still need a second account to do it with. Was doing some Spring cleaning on my PC while in Lecture; and doing some OSRS Motherlode Mine. Got up to 52 Mining, a pre-req for the Legends Quest. Still going to need 60 for Lunar Diplomacy though. Got my first "Sealed Clue" today while mining red sandstone, it's a hard cluescroll, not gonna open it yet but pretty neat I suppose. I was WAY ahead of my max by end of year schedule, didn't get much done in February though because I spent a lot of time playing OSRS as well as getting back into LoL. Didn't play much during DXP which is kind of a shame but it is what it is. By my estimates, based on how lazily I've been playing RS3, I should have 99 Dungeoneering by the end of the month at which point I will have to choose the next cape to get. So I can High Alch - Black D'Hide Bodies for 8,088gp each. I'm buying Black D'Hide Bodies for 7644gp each, going to round that up to 7,650gp because I expect the price to go up if I keep buying limit constantly, but they have a GE trade limit of 70 per 4 hours. Sadly, I don't have the surplus cash in OSRS to just buy out multiple limits overnight yet. That aside, just got 44 Runecrafting and can start the glorious and long process of making nature runes.